General Lee’s surrender at Appomattox marked the official end of the Civil War, but it didn’t mean an end to the nation’s troubles. Bitter disagreements about how the South should rejoin the nation followed. As America’s Centennial (100 years as a nation) approached, people were glad for a reason to celebrate. President Ulysses S. Grant opened the Exposition in May 10, 1876 in Philadelphia, Pennsylvania. The exposition was the first world’s fair and ran through November of 1876. Ten million visitors came to the exposition, which offered renewed hope for the country’s future at a time when many people felt discouraged. 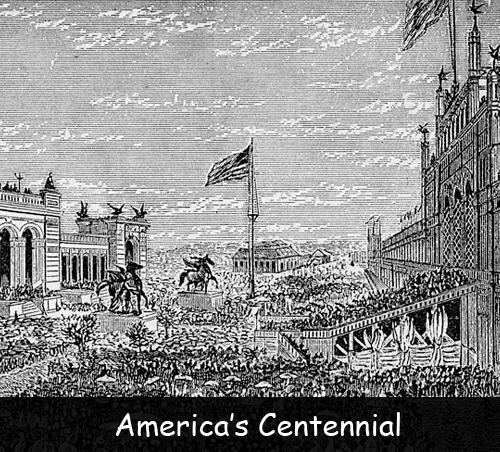 The Centennial Exposition took over 10 years to plan. A giant Corliss steam engine was a highlight of the show. It quietly powered all the machinery in Machinery Hall. Alexander Graham Bell exhibited a machine that would allow people to talk to one another from a distance through a wire – the first telephone. Over 300 Native Americans participated in an exhibit that educated visitors on the Native American way of life. Many of them camped at the exposition. Exhibits showcasing America’s natural resources included rocks and gems, as well as preserved animals, such as a 15-foot walrus, a polar bear, sharks, and stingrays. These displays were provided by the Smithsonian Institution. Exhibits from around the world arrived for display. When the exposition was over, people wondered what to do with all the exhibits. Many of the exhibits were permanently stored at the Smithsonian Institution. They were brought out and shared again during America’s Bicentennial (200 year anniversary) in 1976. View some images from the Centennial Exposition. Declan, Tobin. " America’s Centennial Facts For Kids ." American History for Kids, Apr 2019. Web. 21 Apr 2019. < https://www.americanhistoryforkids.com/americas-centennial/ >.